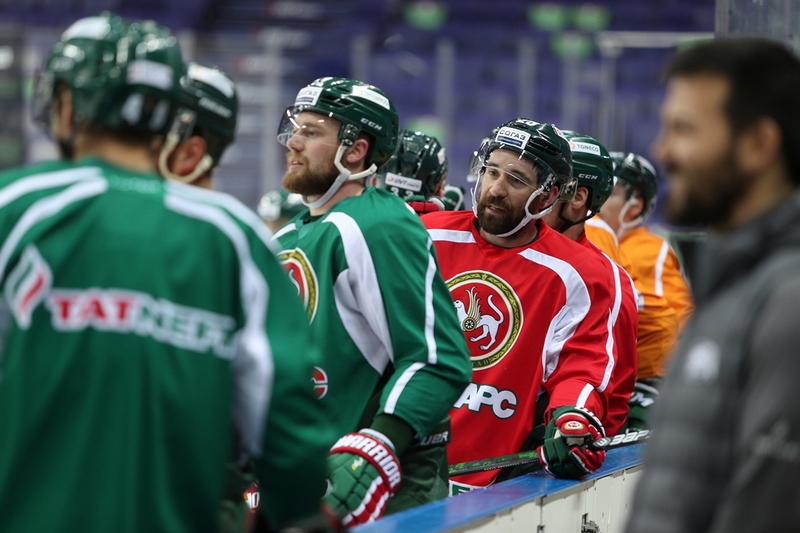 Zaripov sheds blood, Sekac returns, Bilyaletdinov schemes, Lukoyanov gives out advice and Potapov prepares for his first final – KHL.ru reports on Gagarin Cup finalist Ak Bars from the Kazan team's open training session. Following Ak Bars's 3-1 victory over Traktor in Chelyabinsk last Thursday, which secured the Kazan men a 4-0 series sweep, it seemed that team boss Zinetula Bilyaletdinov was already in planning mode, heading straight from the press conference to the elevator and thence to the bus which swiftly carried the team to the airport. 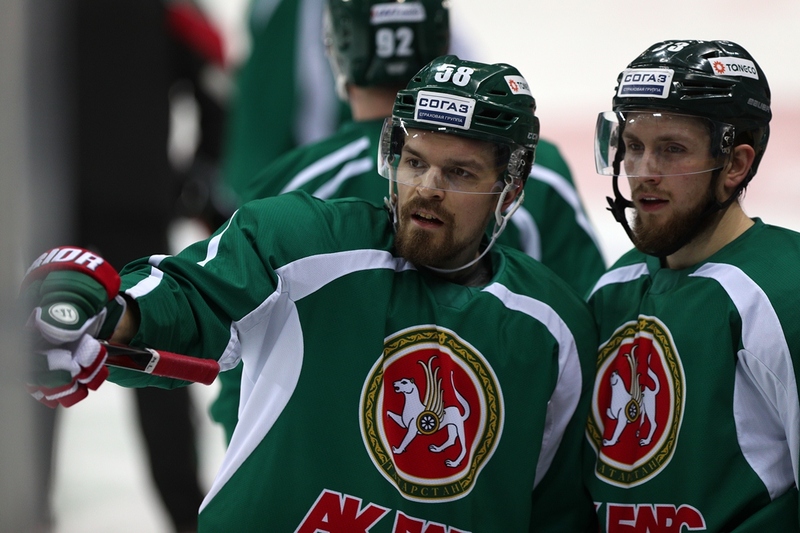 – Even though we will go out and do battle against them, I really hope that illness won't have any bearing on the series, – said Ak Bars forward Alexander Burmistrov. – We are all human beings. We wish a speedy recovery and a swift return to the ice for any CSKA players who have fallen ill.
– Has your team been vaccinated? – But they have handed out pills to combat any mumps epidemic, as we don't want a single chink in our armor, - Kazan forward Alexei Potapov added, leaving the reporters to guess whether he was joking or being serious. Health and fitness was the first topic of discussion at morning training, thanks to the appearance of Czech forward Jiri Sekac. He was injured during the series with Metallurg Magnitogorsk and the preliminary diagnosis ruled him out for the remainder of the season, so it was a pleasant surprise to see him put through his paces with the rest of the team. – He's still not ready, but the fact he can take part in full training with the team is very encouraging - said Zinetula Bilyaletdinov. – Yes, he's taking shots, but he's he's still not fighting fit. Another notable absentee was former Canadiens alternate captain Andrei Markov. According to the Kazan head coach, the experienced defenseman had just been granted an extra rest period. His comrade in defense, Roman Abrosimov, was in training today, but given that he is yet to feature in this year's playoffs, it is hard to imagine his reaching match-fitness in time for the big showdown with CSKA. CSKA has a great roster, and I know many of the guys. They do not give you much time, in offense or in defense. Beautiful hockey will not bring you victory here. There will be many physical battles, and the games will be fiercely-contested. The on-ice training was intense and lasted over an hour, but some, such as Vladimir Tkachyov, were out there almost half an hour before the full contingent took to the ice. Tkachyov was cheerfully practicing his shooting, aided by the team's third goalie with his Finnish coach. – We're preparing for CSKA. We know how they will play, so our regime is focused solely on that – said Zinetula Bilyaletdinov. The boss was clearly in upbeat mood, although he was as businesslike and formal as ever when talking to the press. – Your guys were playing 2-on-2 at the end. What is the purpose of this? – We rarely do it, We've changed our training sessions, tailoring them specifically for facing CSKA. – In recent years, Ak Bars have enjoyed more success against SKA than against CSKA. Is this team more awkward for your team? – All our opponents are strong. This is the final, so you can't waste time pondering which opponent is awkward for your team and which is not. You have to go out and play. And win. – You said you knew how to play against CSKA. How? – It is our job to answer that question. We will find the answer among ourselves. – Any ideas on how to score against Sorokin and Johansson? – They are good goaltenders, Johansson has showed his best form, and hasn't allowed a goal for the past two games. It is obvious they will make it hard for us to score, and we need to look for ways to solve this problem. Ak Bars now looks like a team that is confident of victory and is ready to win its third Gagarin Cup. However, no-one in Kazan is promising an outbreak of beautiful hockey in the series against CSKA. – For me, this is the first final of my career, - said Alexei Potapov, who joined the Kazan club in a move from Torpedo Nizhny Novgorod during the regular season and slotted seamlessly into the team - I've never reached this far in the playoffs before. For some, a final is a once-in-a-lifetime experience, and many players never get a taste of it in their entire careers, so right now we are fully focussed on the battle which lies ahead, concentrating on our game and our preparations. We must be ready, both physically and mentally. – CSKA in the playoffs is playing a different game to that which we saw from them in the regular season. – CSKA has a great roster, and I know many of the guys. They triumphed over SKA, so we take them very seriously indeed. It will be very tough, regardless of which kind of hockey CSKA will play. They do not give you much time, in offense or in defense. Beautiful hockey will not bring you victory here. There will be many physical battles, and the games will be fiercely-contested. – Znarok spoke about the possible fatigue among those who represented their country at the Olympics, and CSKA has a lot of international players. Does this hand Ak Bars an advantage? – The fact that CSKA players were at the Olympics will not be a deciding factor. Those guys have had time to get physically prepared for facing us. You can always, of course, complain about the weather or some other factor, but in the end, you just have to go out and do your job, which is play to win. It doesn't matter how things are at home, or if anything is giving you pain. We must go out onto the ice and give all we've got. – How important a factor are the goalies? – We talked to Emil Garipov before the playoffs, and with our experienced playoffs battler, Danis Zaripov, and they confirmed that the goaltenders are 75% of the team in the playoffs. One of the most important factors in a team's success. Johansson has been doing a great job, and his team-mates have helped him, but in every series out here in the East we have come up against top-class goalies, so we are ready. Justin's a great player, but he always has been, and we've seen the evidence in every practice session. Still, it's safe to say that in the playoffs he's able to raise his game to an even higher level. He is a key player for us. – Is Johansson's great form down to luck or skill? – I don't think CSKA grabbed the guy from the street – they knew who they were recruiting, had faith in him, and he has justified that faith. – After the end of the series with Traktor, did you want SKA or CSKA in the final? – For me, after the series with Traktor I wanted a holiday. Despite the 4-0 score, the series was a very tough one, and it drained us both physically and emotionally. So I just wanted to relax and then prepare for the final. CSKA's victory is not a sensation, because SKA and CSKA are two top clubs, in the same class. Remember that each of them provided nearly half the players for Team Russia at the Olympics. 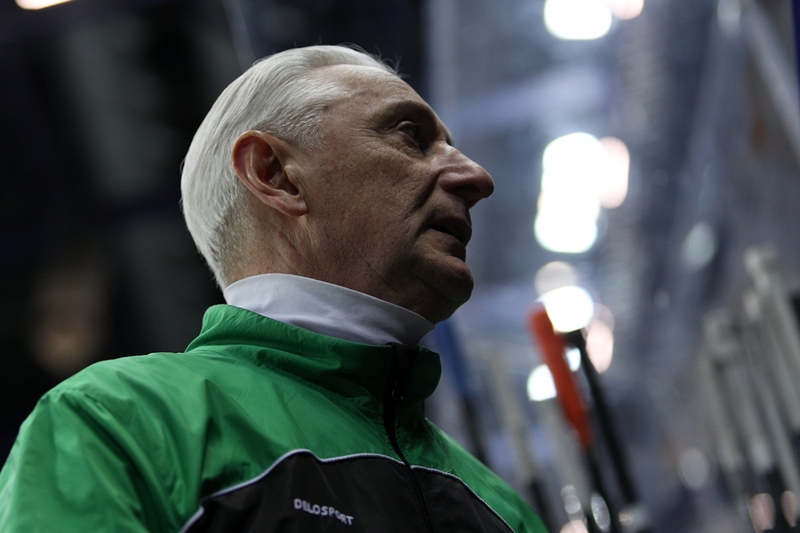 – Ak Bars has had more time to rest and recuperate. – Of course, this is a plus for us, CSKA has expended more emotional and physical energy, although getting past Traktor was far from easy. This short break lets us recharge our batteries, spend time with our families, stroll around the city. A change of scenery, if you like. – Have you ever played against CSKA goalie Lars Johansson? – No, never, but he seems very impressive. We'll try to find a way to beat him. – What can you say about CSKA? – It is a fine team that plays well in powerplay and when short-handed. The series will be a close one, and I don't think there will be an abundance of goals. – Your partner, Justin Azevedo, is now the top scorer in the Gagarin Cup playoffs. – Justin's a great player, but he always has been, and we've seen the evidence in every practice session. Still, it's safe to say that in the playoffs he's able to raise his game to an even higher level. He is a key player for us, so we are very happy that he's plays on our side, for Ak Bars, and we believe his fine run of form will continue. Another Ak Bars player who has been steadily gathering momentum and points in the playoffs is Danis Zaripov. No-one could accuse the Kazan Men of taking it easy in training, and during this session a stray puck strikes Danis square in the face. The legendary, multi-titled veteran has to take a short break on the bench in order to stem the flow of blood from his nose. During the series with Traktor, Zaripov promised the news-hungry press pack that he would answer all their questions after the end of the Eastern Conference final, but it would be poor form to pester him for his thoughts while he was shedding blood from this unexpected knock, Fortunately, Ak Bars is the kind of team where pretty much all the players are willing to share a few words, even while preparing for the most crucial games. I've never reached this far in the playoffs before. For some, a final is a once-in-a-lifetime experience, and many players never get a taste of it in their entire careers, so right now we are fully focused on the battle which lies ahead, concentrating on our game, and our preparations. – What is the main focus now in your training? – Intensity training. We need to start the final series in good shape, hit the ground running, and to be ready to play all through all the games, - said former Atlanta and Winnipeg forward, Alexander Burmistrov. - CSKA is a team that consistently plays at a very high level, and has produced excellent hockey all through the season. I think the two teams are very similar. – You used to play in the same line as Kirill Petrov for Ak Bars, but how often have you faced each other on opposing sides? – I've played alongside Kirill since childhood. And we were on opposing sides only recently, in January, when CSKA came to Kazan. And back in our youth, when he was at Spartak. Now we have the final, and the Gagarin Cup is at stake, so friendship will be suspended while we're out on the ice. – And that was not a happy ending for us. This time we will do all we can to win.